pollution that a coal-fired power plant would emit to generate the same amount of electrical power. RIVERS -- Up to 300 paddlers advocated removal of the lower four dams on the Snake River on Saturday with a peaceful Free the Snake protest that staged near Lower Granite Dam. The conservationists converged on the lower Snake to protest what they call four "do-nothing dams that consume taxpayer dollars while inflicting an extreme toll on Idaho's endangered salmon," according to Idaho Rivers United, one of the groups involved. The U.S. Army Corps of Engineers has a different view point, which is posted below. 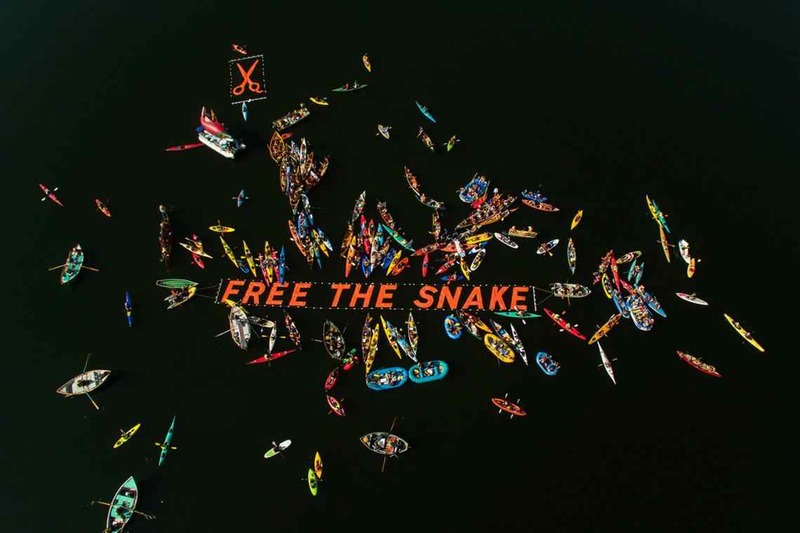 The Free the Snake Flotilla protesters contend the dams cause costly harm to Snake River salmon and steelhead. They say the relatively little power generated by the dams doesn't cover the losses to fisheries and the outfitting that could be done on the river if it were returned to free-flowing condition. The barging industry is heavily subsidized and could be replaced by rail, they say, adding that the energy produced by the dams could be made up by green alternatives. Save Our wild Salmon, another group involved in the protest, says it is committed to working with farmers and others to further support the shift to rail and other transportation that is already occurring. "We look forward to working with other stakeholders to bring back the tremendous fish and wildlife habitat, recreational opportunities, orchards, free-flowing waterfront (instead of the Lewiston levies) and other values now lost under stagnant reservoirs," said Sam Mace, SOS spokeswoman in Spokane. Participants in the flotilla gathered at Wawawai Landing on the north bank of Lower Granite Lake, the farthest upstream of the four lower Snake River reservoirs and 3 miles from Lower Granite Dam. The flotilla headed toward Lower Granite Dam where the main rally in support of a free-flowing lower Snake River was held before paddling back. Meanwhile, here's a statement from Lt. Col. Tim Vail, Commander of the U.S. Army Corps of Engineers, Walla Walla District, who contends that Snake River dams provide outstanding value. We've heard a lot of discussion about the Corps' four dams on the lower Snake River. I'd like to take a few minutes and tell you why they provide outstanding value to the Nation. Before the summer began, Idaho Sockeye managers were forecasting 4000 adults to return to the Stanley Basin this year. Less than 100 arrived and more than half of those arrived by truck. This does not look like a path to the delisting of Idaho's Sockeye anytime soon. Maybe we should just trust the government. What do they have to tell us? Lower Snake River Compensation Hatcheries cost $39 million per year and commander Timothy Vail somehow forgot to include that cost. Then there is also the $450 - $750 million per year (depending if you tally in foregone power sales due to water sent over spillways to aid juvenile fish migration) of annual fish "recovery" costs that one might suppose would decrease if Idaho's ESA-listed species were recovered and removed from being in need of ESA protection. Then there is the money being spent from the Pacific Coast Salmon Recovery Fund, the Salmon Habitat Restoration Initiative and the annual purchase of water from willing sellers for Flow Augmentation. Then also there is the hugely overbudget Columbia River Fish Mitigation but not to worry about that much, our children and there children will be paying for those capital expenditures slowly over time. The NW Power Conservation Council staff recently asked for permission to study the economics and help provide clarity surrounding the debate, newly raised by Jim Waddell's reairing ACOE forecasts. But for some unknown reason, Council member Jim Yost thought that such an economic analysis should be put off "for one to two years." Go figure. I for one am not willing to just trust our government to handle this. How about you?